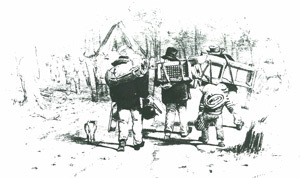 Through the adventures of a gold digger, Denis O’Reilly, students are taken into the Victorian gold rushes of 1851-4. Utilizing digger’s songs, music and poetry, documents, maps, flags, newspaper reports and gold-seekers tales, Gold in the Heart tells of the European, Chinese and Indigenous (Dja Dja Wurrung) experience, and journeys into the politics of the government’s Gold Licence, the hitherto unknown history of the 1851 Monster Meeting which set alight the diggers demand for a vote that led to Eureka and democracy in Australia. 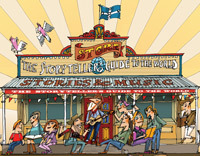 Five students play roles in the show, with scripts sent ahead. 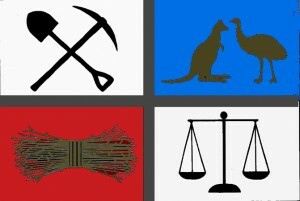 The flag from the 1851 Monster Meeting at Castlemaine and the 1853 Red Ribbon Agitation at Bendigo.It’s a story of how ordinary people dreamt of a better life and of democracy, and how some made it rich whilst others died, the diggers all the while singing of a ‘good time a coming’. 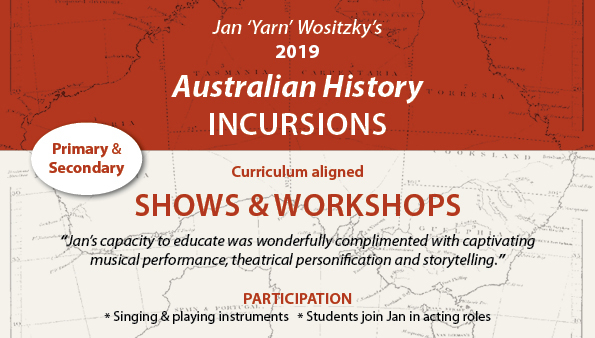 Because Jan lives in Castlemaine, where the gold rush history is etched into the landscape, he brings his personal experiences into this show.